Preheat the oven to 400. Trim the beets and wrap in one foil packet drizzled with a tablespoon of water. Roast for 1 hour or until tender when pierced through with a knife. Once the cooked beets are cool enough to handle, peel them by rubbing the skin off between paper towels. Warning: This will dye your hands bright red. Cut the peeled beets in to 1" pieces and toss with 2 tablespoons of Cranberry-Pear White Balsamic whisked together with 2 tablespoons of olive oil, and set aside. In a medium size bowl, whisk the remaining Cranberry-Pear White Balsamic with the grainy mustard until well combined. Slowly drizzle in your olive oil of choice, whisking constantly until the mixture is thickened or emulsified. Add freshly ground pepper and sea salt to taste. Arrange the greens in a bowl or on a platter and dress with the Cranberry-Pear White Balsamic vinaigrette. 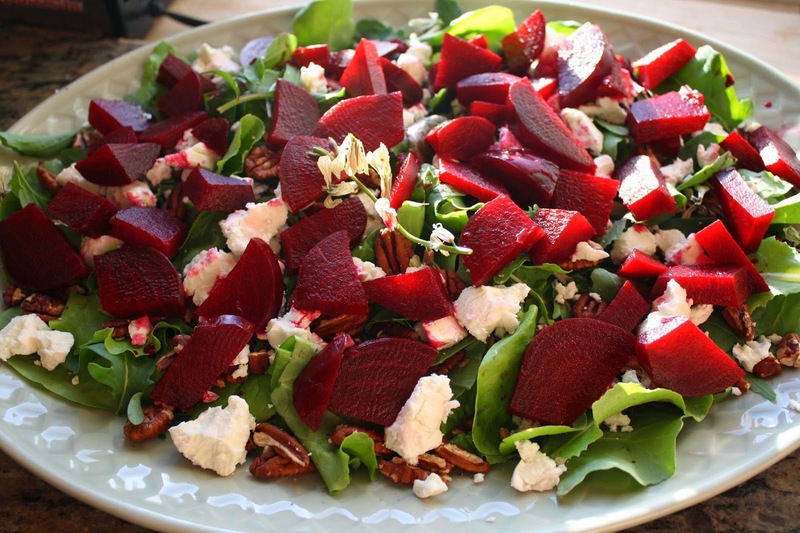 Add the marinated roasted beets to the salad, along with the crumbled fresh goat cheese and toasted pecans.